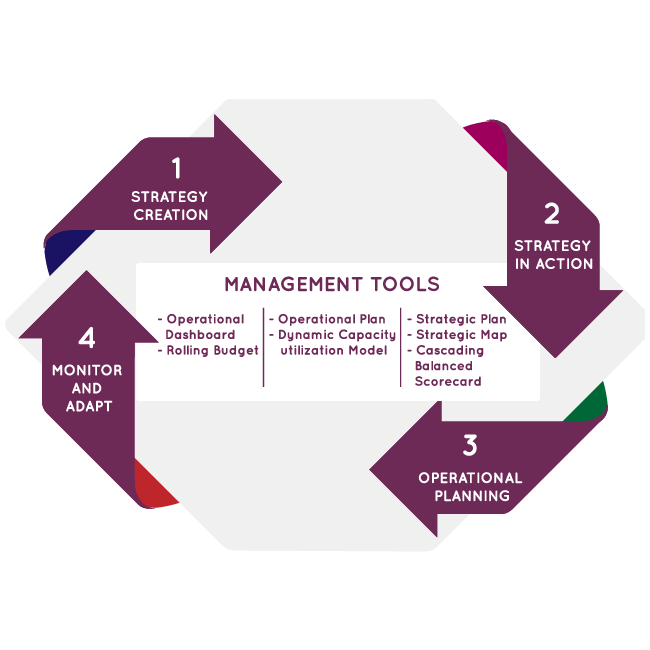 KOMAND Strategy Management Process | KOMAND Consulting Inc. The strategy management process is the way in which companies decide which markets they want to compete in, how they plan on competing in those markets, what initiatives need to be accomplished to execute their competitive strategy and how they will measure progress and performance. All too often, companies view strategic planning as a one-off exercise that is carried out every few years to satisfy the board of directors or the executive leadership team. It’s no surprise then that 80 to 90% of strategic plans are a huge flop with no incremental financial gains realized. As a statistically driven strategic planning firm, we’ve done our research on why there is such a high failure rate with strategic implementations. It turns out that the sophistication level of the strategy management process is a key driver – the more sophisticated the strategy management process, the better the results. So it’s not a question of if your organization should adopt a systematic strategy management process but rather how it should go about it. At KOMAND, we have developed a detailed strategy management process that helps our clients make the optimal high-impact decisions and ensures employee engagement at all levels.